The shrine Awashima jinja is well visited by women praying for childbirth, and is most famous for its large collection of hina dolls. 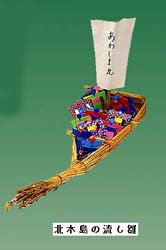 Nagashibina, dolls put on boats and floated in the sea are most popular. The Shrine Awashima in Wakayama is said to date back to the 3rd century and the legendary empress Jinmu. On the way home from a military expedition to Korea, her ship encountered a storm and was nearly sunk. During the storm, she had prayed to the gods to save her ship, and threw a rush mat called a toma into the sea. She followed the current that the mat was floating down, and arrived safely to an island called Tomogashima (then known as Awashima), where she found a small shrine dedicated to the god Sukunahikona-no-mikoto. She was so thankful for being saved that she donated the treasures she was carrying on board her ship to the shrine. The Shrine's deity was a medicine god, who had the power to cure female diseases, and to help women become pregnant. Because of the empress's association with the shrine, it became associated with feminine things like dolls, sewing needles, fertility, and gynecological illnesses. During the Edo period (1603 - 1867), women began to make offerings of their underwear to Sukunahikona-no-mikoto, hoping that he would cure them of karyoubyou (literally 'flower and willow diseases', a euphemism for STDs) and various other women's complaints. There are many Awashima Halls 淡島堂 Awashima Do, in Japan, dating back to Awashima Gannin 淡島願人 and his followers, who walked all along Japan and dispersed the belief in this healing shrine. at Awashima Jinja 淡島神社 . 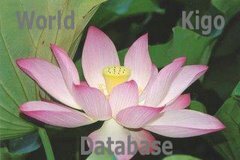 Devotion to the Awashima kami based on beliefs about the kami's efficacy in curing female ailments, helping to conceive children, and ensuring safe childbirth. Kada Jinja, the head shrine among the Awashima shrines throughout the country, is in Wakayama Prefecture's Kaisōgun county, and is a one of the shikinaisha, or shrines recorded in the classic Shinto text Engishiki. Kada Shrine is also called Awashima Myōjin, and popularly referred to as the Ebisu kami. According to legend, the kami of Awashima, who was the divine consort of Sumiyoshi Myōjin, became afflicted with a female ailment (fujinbyō) and exiled to Awashima. Because of her own suffering, she vowed to heal the illnesses of women. Today, this legend connecting the two kami of Sumiyoshi and Awashima is attributed to the fact that Awashima was a "shrine land" (shinryō) of Sumiyoshi Shrine. During the Edo Period, devotees of Awashima, known as "Awashima ganjin," traveled the country carrying small portable shrines (zushi) containing anthropomorphized dolls of Awashima Myōjin bound in pieces of cloth. These devotees performed in front of people's homes in exchange for alms or offered their services as "representative pilgrims" (daisan), leading to the country-wide propagation of this devotion to Awashima. There is a custom at the shrine whereby people make offerings of hina ningyō (dolls used in the annual Hina Matsuri or Doll Festival), combs, or hair ornaments (kanzashi), and the shrine provides paper Awashima bina dolls to visitors. The ladies of Edo who could not make it themselves would give a strip of their robe to a special "substitute pilgrim", who was walking around in Edo with a little Awashima Shrine on his back. When his collection of tokens was big enough, he started his trip to the real shrine, making the offerings and bringing back amulets for the ladies. The dolls are placed on a simple boat made from wheat straw. The boats are hand-made by each family and not for sale. Some other islands of the Kasaoka island chain also have this custom. The dolls are floated in the ocean one day after the festival on March 3. The boats are about 80 cm long. Inside are 12 paper dolls, also made by each family. (One imperial pair, one boatman, 9 palace maiden). On leap years there is one more doll of a palace maiden. On the sail of the boat, the letters Awashima maru あわしま丸 (boat bound for Awashima) are written. People hope they will float all the way to Wakayama, to the shrine Awashima Jinja 淡嶋神社 at Kada no Ura 加太の浦.
. Folk Toys of Okayama . is an island in Hyōgo Prefecture, Japan, in the eastern part of the Seto Inland Sea between the islands of Honshū and Shikoku. The island has an area of 592.17 km². As a transit between those two islands Awaji originally means "the road to Awa", the historic province bordering the Shikoku side of the Naruto Strait, now part of Tokushima Prefecture. The island is separated from Honshū by the Akashi Strait and from Shikoku by the Naruto Strait. Since April 5, 1998 it is connected to Kobe on Honshū by the Akashi-Kaikyō Bridge, the longest suspension bridge in the world. According to the creation myth in Shinto Awaji was the first of the ōyashima islands born from the two kami Izanagi and Izanami. Awaji constituted a province between the 7th and the 19th century, Awaji Province, and was a part of Nankaido 南海道 Southern Sea Road. Today the island consists of three municipalities, Awaji, Sumoto and Minamiawaji. In the village of 下川 Shimokawa, the unmarried girls came together every month on the third day to do needlework, went to the shrine in the fields and offered prayers. In 三崎 Misaki, the day was not fixed. But about 50 years ago, all these customs came to an end. Sometimes people who believe in 淡島様 Awashima Sama meet at an open space and dance around the unmarried girls. Sometimes the Deity comes to possess a girl as a kind of Kamioroshi.